On Thursday|18th July 2013, a Traditional Palanquin PURA PRAVESH Procession has been arranged for H.H Shrimath Samyamindra Thirtha Swamiji (Patta Shishya of H.H Shrimath Sudhindra Thirtha Swamiji, Mathadhipati of Shree Kashi Math Samsthan) along with Shree Samsthan Deities on their arrival from Hubli Mokkam, for observing the Vijaya Nama Samvatsara Chaturmas Vritha at Bangalore Shri Kashi Math. 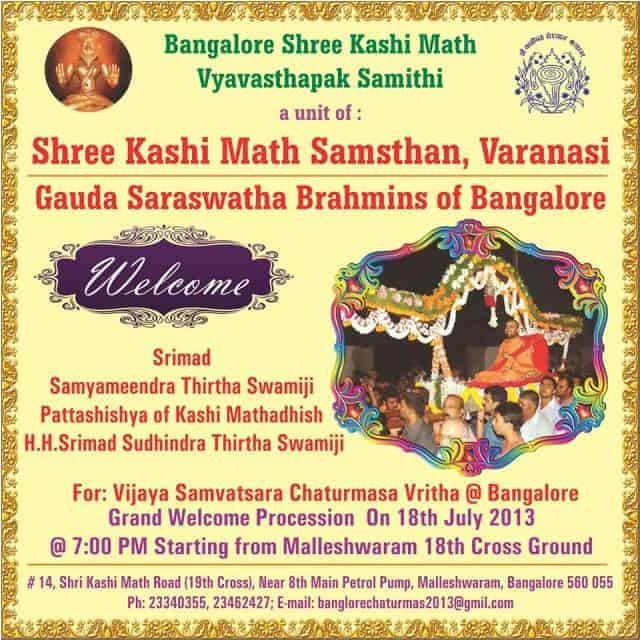 The PURA PRAVESH Procession will start at 07:00 P.M from Malleshwaram 18th Cross grounds with traditional Hilali , Divatige, Chatra-Chamara, Vaadya, Vedaghosha, Chande, Bhajana, Stotras and will reach Bangalore Shri Kashi Math on 19th cross by 07:45 P.M which will be followed by “Swagatha Samarambh to Welcome Swamiji . This will be followed by Maha-Pooja to Lord Sri Parthasarathy by 08:45 P.M and Bhojana Prasad. Devotees are expected to attend the event in large numbers and to invoke the grace of Sri Hari-Guru.